8 + 5 = ? : (Required) Please type in the correct answer to the math question. With daylight, we could see what a neat place is the Escatawpa Hollow Campground at Wilmer. It is right beside the Escatawpa River and rents canoes. The property is treed with high pines that didn't block the satellite in our campsite. Highway 98 is in good shape and 4 lanes when you get to Mississippi. We arrived in Vicksburg about 1:00PM and got a site at the Ameristar RV Park beside the casino. Vicksburg is the site of one of the great battles of the Civil War where the South consistently won with heavy union losses but in the end were surrounded and unable to re-provision, so after several months, surrendered. Most interesting to me was the naval battle. It seems that James Ead, the great engineer of the 19th century, came up with the idea of building 7 ironclad steam powered gun boats that could capture the Mississippi, Tennessee and Cumberland Rivers and cut off the supply chain to the South. 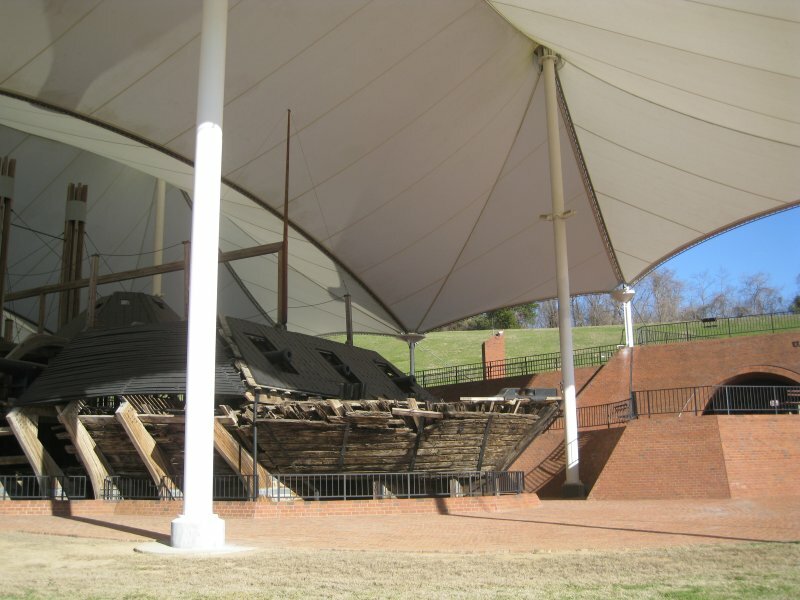 Ead's gun boats were involved in the battle at Fort Donelson, TN which was the turning point in the war for Nashville. One of his boats, the Cairo, was sunk by a confederate torpedo (mine) triggered electrically by a soldier on the shore in December 1862. The Cairo sank on the Yazoo River near Vicksburg. The remains were raised in 1964 and opened to the public in the Vicksburg National Military Park in 1985. The ship is protected by a huge canopy.